After going 4-0 in Session 1 of the GNBA Eastern Conference (Waukegan, IL), with a major signature win over challenger Mac Irvin, many sights were set on Team Ramey and their 8th grade lineup. 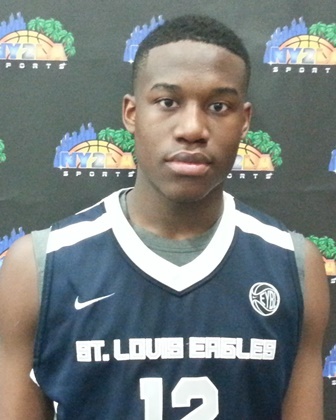 One of the key cogs in that lineup that is looking to make big marks on the youth basketball stage this spring is 2018 G/F Fred Thatch of St. Louis, MO. The young wing brings a physicality, developing skill-set and natural drive to the court that will lead his progression, as well as his team’s progression, through the coming months. Thatch is a powerful guard/wing that has quicker feet than meets the eye and an explosiveness when attacking that is difficult for kids at that level to compete with. With good handle and an eye for open gaps or lanes to penetrate, the 6-2 prospect is excellent penetrating to the rim. When he gets there, he is a strong finisher and can do it through contact, which also allows him opportunities to convert three-point plays at the free throw line. When facing defenders who try to cut off his ability to attack those lane-lines, Thatch also showed in Waukegan that he can step in and knock down pull-up mid-range jumpers, and he also sent in a couple floaters kissed off the glass. As he adds a more confident perimeter stroke to his game, Thatch will become a triple scoring threat that makes players of his size and build extremely tough to defend. Rebounding is another key aspect to the 2018 wing’s game, and in today’s style of play, he will dominate games when he remains active on the glass on both ends, something he did very well in Session 1. Thatch sniffed out chances to get second opportunities offensively and rewarded himself with a couple easy baskets that helped his team fortify leads, and also was awesome on the boards defensively. Defense in general is a strong suit for the 190-pound athlete that can muscle up against post players on the interior and keep them away from the hoop, or overpower guards out top and get his hands on steals to convert the other way. Thatch also did a nice job in Waukegan of coming over from the weak side and timing out some key blocks to deny lay-ups, while keeping himself out of foul trouble despite his physical presence. Thatch is a naturally instinctive player with a great frame, and the determination on the floor to keep his team in games and fighting. While his overall skill-set is still developing as most his age, the tools are in place and he is already an accomplished finisher going to the basket. Big things are expected from him and his teammates, but you can be certain Fred Thatch is backing down to nothing and no one in the game of basketball. He averaged 12.2 points, 5.2 rebounds and 2.5 steals per game to open GNBA Eastern Conference competition.